The AX2200 and AX2300 Multi-variable Vortex Flow Meters from Azbil North America employ three sensing elements in a single meter; a vortex shedding velocity sensor, an RTD temperature sensor, and a solid state pressure transducer. This unique combination allows accurate mass flow measurements of gases, liquids and steam. When compared to traditional methods involving multiple instruments, the AX2200/AX2300 can save you time, installation costs while providing a safer measurement by reducing potential leak paths. Available in both Inline and Insertion styles, the AX2200 / AX2300 provides the flexibility to install in almost any location – including “hot tapping”. The Inline version is available for line sizes from 1/2″ to 8″ diameter. The Insertion version can be installed on any pipe size 2″ in diameter and above. 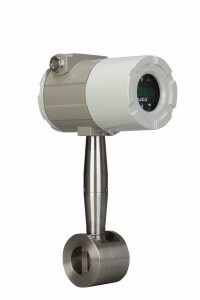 AX2200 and AX2300 Multi-variable Vortex Flow Meters. 2 Vortex multi-variable meters from Azbil North America employ three sensing elements in a single meter: a vortex shedding velocity sensor, an RTD temperature sensor, and a solid-state pressure transducer. Within this single instrument, you can measure the mass fl ow rates of gasses, liquids, and steam with far more accuracy than with external measurement techniques which may not adequately compensate for dynamic process conditions. With the flexibility to install in almost any location—including hot tapping—you can get precise measurements from nearly any location when you need it. Multi-variable capability within this single housing can also simplify systems, reduce equipment cost, and ease installation and maintenance hassles . Th e wide variety of options and configurations available ensures that there is a meter for any application requirement.